Used in combination with employee satisfaction surveys, exit interviews are a rich source of information for organization improvement. Another advantage of exit interviews conducted with Survey Anyplace is the ability to process feedback immediately. Automatically transfer or update your data to your CRM or any other HR tool you’re using via our Zapier integration. Custom colors, icons, and formats make sure your exit interview matches your brand identity. For more advanced branding option, check our white label solution. Advanced skip logic lets your respondent take the quickest route through the exit interview by only showing questions that apply to him. Why Organize an Exit Interview? An exit interview is an interview conducted in the presence of someone who is leaving an organization. Most commonly, this occurs between an employee and an organization, a student, and an educational institution, or a member and an association. The exit interview is an invaluable source of information to assess the overall quality of work life within your organization and identify opportunities to improve retention and employee engagement. Do you need more reasons why you should be implementing a structured exit interview process in your organization? You will get a candid assessment of your organization’s environment and culture as departing employees are generally more forthcoming. You will learn the reason for an employee’s departure – it may be different than you think! It provides the opportunity to ask if there are any open issues of which you need to be aware. This can help reduce risk and idenitfy matters that may require immediate attention. How to get your exit interview participation rate up to 60% or more. It is important for each organization to customize its own exit interview in order to maintain the highest levels of survey validity and reliability. Research shows that the average response rate for exit interviews is approximately 30%. With just a little extra effort, you should be able to double that response rate. The easiest way is to cheat the system. Simply make the exit interview obligatory. Start by analyzing your current exit interview process. Chances are the current process is experienced difficult or uncomfortable by the interviewee. Reduce the length of the exit interview. One of the most heard reasons why employees choose not to complete the exit interview is because it is too long and time-consuming. Some exit interviews have over 70 questions! Why would someone, who’s leaving the company, go through that kind of torment? Reducing this number by grouping them in different topics will allow you to shorten the exit interview drastically. By applying skip logic you can automatically skip all irrelevant questions in each interview, reducing the interview length up to 35%. Review your questions for simplicity. Avoid confusing or personally invasive questions. Put yourself in the employee’s shoes and ask yourself how you would feel answering the questions. Avoid questions that ask for feelings and emotions. A clean and simplified process is also important. The form should be laid out nicely with an intuitive and easy to understand design. Let employees know that you value their input and inform them that the honest feedback will not result in repercussions. Often the employee doesn’t believe that the interview will make a difference or he is afraid of losing his chances for a reference, which could influence the respondent’s answers and result in biased answers or reduced participation. Make sure the respondent knows that statements made on an exit interview should never be used to prevent future eligibility for rehire. The employee is angry at the company. Anger is a bad adviser. It may lead employees to feel they don’t want to help by participating in the exit interview. These employees can be encouraged to vent their anger in the exit interview. Many of these angry employees are thrilled with the chance to have their voice heard. Sometimes it’s not you, but them. Employees are people with dreams and ambition. If there’s a gap between what they want and what the company offers, it’s only a matter of time before they start getting cold feet. A good follow up question here is to ask if the job turned out to be what the employee expected. How has your job description changed since you were hired? In a world that’s becoming more and more digital functions change, responsibilities are added and new skills are required. This doesn’t necessarily change the nature of the work in the future, but it would certainly help us know how to sell the job more effectively and accurately to result in better hires (which is the toughest nut of all to crack). One of our favorite ones because it’s not about the company, but about the coworkers and colleagues. It will give you less job-related answers, but more insights in your employees, who are still your first line brand ambassadors. Can you provide more information, such as specific examples? A lot of common exit interview questions are close-ended ones, but this follow-up question, which can be beneficial throughout your survey, reveals actionable data which may prevent the loss of other employees. Have you shared your concerns with anyone in the company prior to deciding to leave? What was the response? There might be a lot of water cooler talk going on without you knowing it. The employee might have shared his concerns with five to ten people. Remember: Nothing travels faster than the speed of light, with the possible exception of bad news or gossip, which obeys its own special laws.’ To avoid an exodus, locate the root of the problem and fix it with clear and transparent communication. It’s an indirect way of asking whether the employee liked the company’s culture and values and not just the employee’s function. It could also be an indicator of the employee’s willingness to return to the company at a later point in time. Don’t ask targeted questions about specific people or issues. It’s fine to ask for general feedback about a supervisor, but don’t insert your opinions into the conversation. Don’t feed office gossip. It’s never constructive and won’t be reliable information. Don’t get into personal issues. Keep the conversation professional and work-related. Don’t say anything that could be misinterpreted. The conversation should focus on the employee’s experience. Although he or she may have negative things to say about certain people, you should listen without bias. Don’t try to convince the employee to change stay with your company. This should have happened before there was a need for an exit interview. 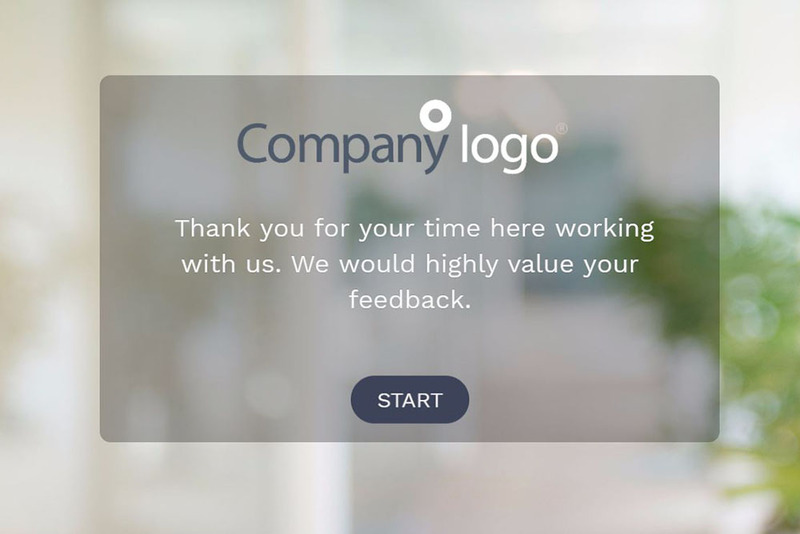 To use this sample exit interview, sign up for Survey Anyplace , and choose ‘exit interview’ as template when creating a new survey. Looking for more HR surveys? Assessments and quizzes are an integral part of the services that we offer. I tried a few survey instruments before I chose this one. One of its best features is indicated in the name. Survey Anyplace – mobile, offline, websites, social media, anyplace! The results can be easily distributed and there is an instant results option. An easy to use dashboard, easy to read and analyze results. For me easy means saving time and money! And another big plus – responsive and helpful customer service.